I just got back from attending Convergence (my biennial weaving conference) in Milwaukee. It was a good conference though a bit smaller than past shows. I was told that attendance is going up and I hope so as it’s such a loss not having more attendees and vendors around. Some of the things that I really enjoyed were my classes, the vendors, the Art Museum and the other gallery shows, the companionship of the other weavers and previewing the Rug Auction. My paperless book class with Judi Dominic was fab. She always has great ideas and I can identify with constantly finding new ideas to work with. Here’s my new books made from felted sweaters she brought in as well as some lace and beads from my stash and buttons from hers. My other two classes were with Becka Rahn. She designs digital fabric among other talents. Her classes were great and lots of information. She had a couple of pieces in the fashion show. A word about the fashion show. This is usually a highlight of the conference. This year however, there was a major technical issue that no one bothered to address. Instead the entire audience was blinded by these huge spotlights which made it not only impossible to focus on any of the models walking on the runway, but the colors were every impossible to tell. I thought this blue dress was grey! It was a huge disappointment. I suggest that next time the conference committee actually thinks about the audience and our ability to see. Otherwise, I’ll skip the entire show and just wait for the gallery show. Here’s a couple more pieces that I missed during the show! The other show I went to was called Small Expressions and it was at the Public Art Museum which is free on the first friday. The museum itself is a piece of art. I rode the trolley back to the hotel and got a guided tour along the way. What fun! The vendors at a weaving conference are amazing. There are looms all around being demoed on. You can pick up other tools and accessories. Yarn, beads, clothing, books, etc. etc. I managed to buy a few more skeins of yarn, found a lovely piece of shibori dyed leather and wandered around just in heaven. It’s nice to have so many options available when you live in area with only one weaving store. Since the Albuquerque Convergence, there has been a Rug Auction on the last night. I and my two roommates went to the preview of the rugs. Wow. I wished I had been staying to participate. Many options including this great train rug. In two years, I’ll plan to attend and maybe I can get my train rug. In two more years is next Convergence. Hopefully by then I’ll actually have something to submit for one of the exhibits. Be able to make something out of one of my recent purchases. Buy a Navajo rug. And learn something new. And hopefully be a teacher! I just read “Talking Mysteries, a conversation with Tony Hillerman”, which I had picked up when I was in Albuquerque last fall. It’s a delightful book and inspired me to re-read all of his novels again. If you haven’t read these mysteries, you are really missing out on a great series. I’ve been trying to get through the books for the past two weeks. Almost like my birthday present to myself. Joseph Leaphorn spends a lot of his time working through his cases by reviewing all his evidence; while also looking at the scenery around the four corners area of the southwest. As he drives around, he mentions that he is “enjoying the beauty of the view.” He talks about how finding balance and beauty is something he constantly tries to balance. It reminded me of how when I used to visit my parents that we’d go for rides just to drive and enjoy the beauty of the view ourselves. We’d go by the horse pastures, look at the barns and cows, and see the Vermont blue mountains. And even just drive down roads sided by tall green trees. Just to drive. And to be in the moment. It was wonderful. In the past six months, I’ve been trying to remember how to be in the moment. And to enjoy the beauty around me. It’s a task that I try to keep myself working towards. In Tucson, you don’t really go for drives as generally you are going from point A to point B and not much in-between. Not many tree lined streets here. Not much time to try to enjoy the beauty of life. But I try to remember to take the back road or the less traveled one. And work on seeing when the stillness and beauty of life can find me and find balance. I am continuing my block series. This one I just finished is a winter photo of the house I grew up in, in Newton New Jersey. Very much in the country. A block print of the house where I grew up in winter. I haven’t decided what all these blocks will be but for now am enjoying playing with the photos, using the old wood in my back yard and creating. My families’ thanksgivings were frequently not on the actually day. Most times my dad who was a railroad engineer had to work, so we’d have the meal when he was home. This could have been even be a day or two later. The one time we tried to go to a relative’s house, there was a major snow storm that shut down the interstate so we had to turn around and go home and eat whatever was in the house. Meanwhile my cousin Deanie and her husband had turkey to last them for a very long time. Therefore I always think of thanksgiving as something of holiday to make your own. When I lived in NYC, we went to Chinatown for dinner and went to see the movie Time Bandits. I remember riding the subway up to go see the movie, being full of wonderful Chinese food. Then one year, me and some of my girlfriends rented a cabin in the white mountains of Arizona, loading up on food and alcohol and spent the holiday weekend, hiking, eating and watching classic movies on tv. To this day, Casablanca resonants thanksgiving to me. Last year I went to the Grand Canyon via the train and spent one night there. Though it was filled with enough people to remind you of a black Friday experience, the back drop of that lovely canyon you could block out the crowds. shows and meeting some great people. Seeing Alaska. Seeing the ocean both in Alaska and California. For my great friends. Meeting my great niece and nephew for the first time this past summer (Anna and Matthew!). Experiencing an earthquake. 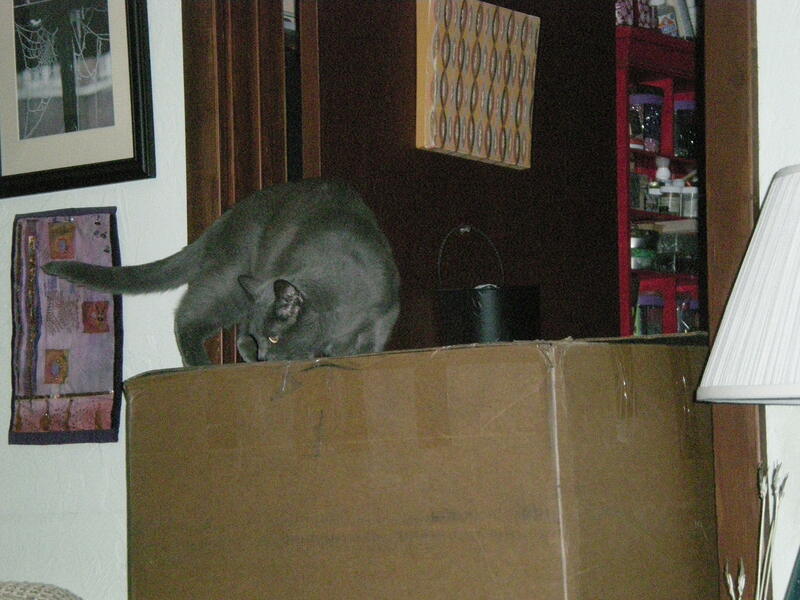 For my kitty Perry who at 22 years old is finally going to leave me. We’ve had a great life together. I’m thankful that Wyatt finished his roof. I’m thankful that I know all these fabulous artist who have inspired me and continue to inspire me to be more creative and stretch my vision. I still believe the thanksgiving holiday can be what you want it to be. My hope is next year to be at another grand canyon or similar seeing another beautiful part of the world. And being grateful for all that I have and all the people, cats and art in my life. I recently went to Alaska on vacation with my good friend Pam. 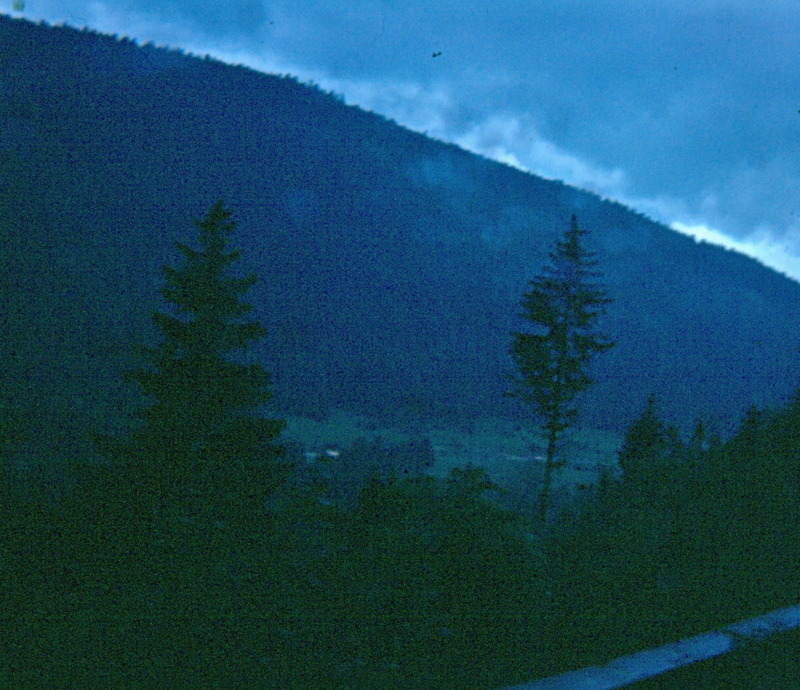 Pam and her husband, Henri had lived in Alaska for several years. Therefore Pam is an experienced “tour guide” and was the perfect person to tag along with for this Alaskan adventure. And since we couldn’t find a workshop to take at the weaving conference, we choose Alaska. My quilting friend Lori joined us as well as she had long wanted to visit here. 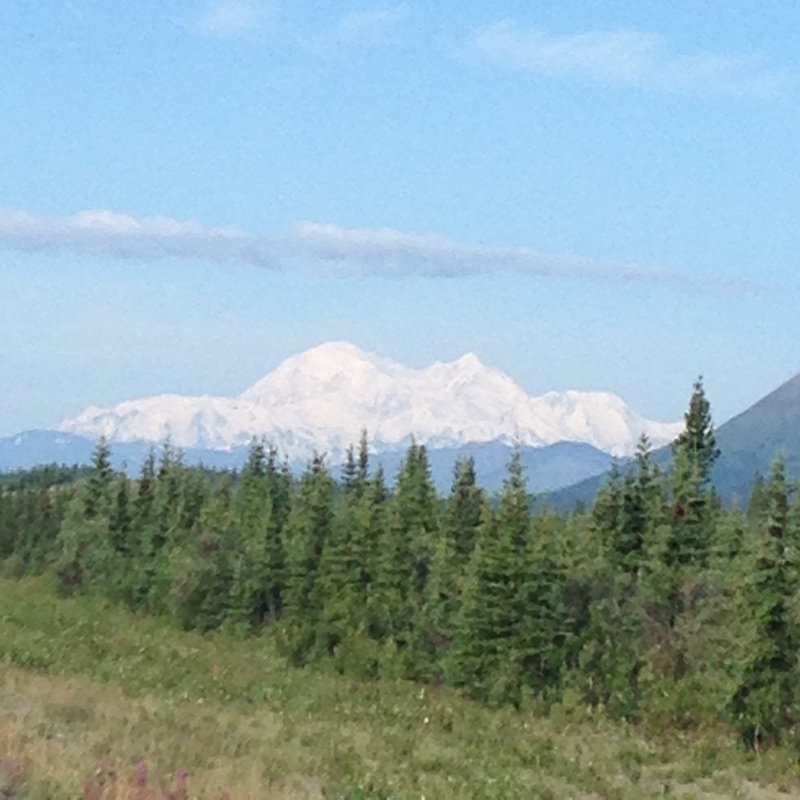 Our first destination was Denali NP or Mt. McKinley. We took the park shuttle bus to Wonderlake which was a destination Pam had never been before. 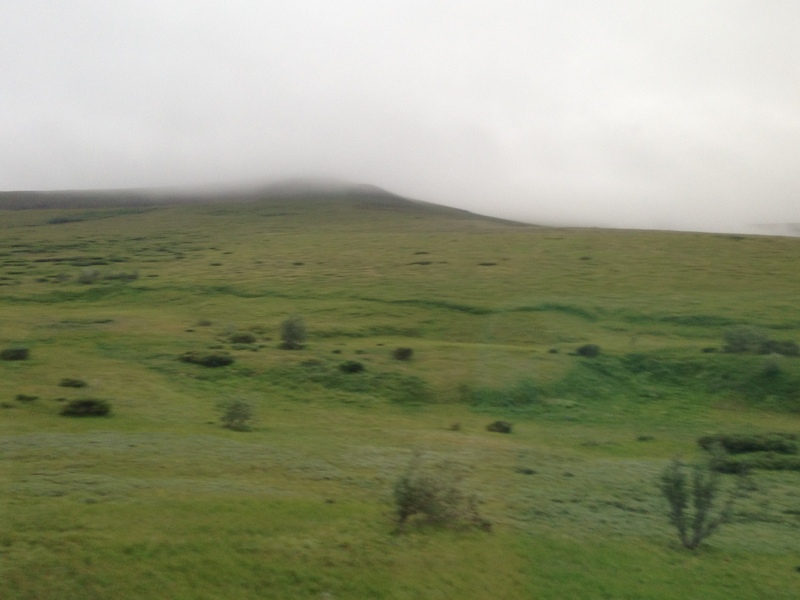 We caught the 5:15am shuttle (very early) but of course not dark outside as it’s summer and the land of the midnight sun. Off we went on this old green bus that reminded me of the school buses I used to ride back and forth on to school. Our driver, Mike had been driving for the park for 25 years. He said at one point that he used to be like all of us, so excited to see this animal or get that picture. But there were times when you could notice he got excited about something we stopped to see. Even the tree that he thought was something else. A cloudy overcast day awaited us with lots of cold air blowing in from the windows. Thankfully I had brought along a pair of borrowed binoculars and was able to see of the animals up closer. 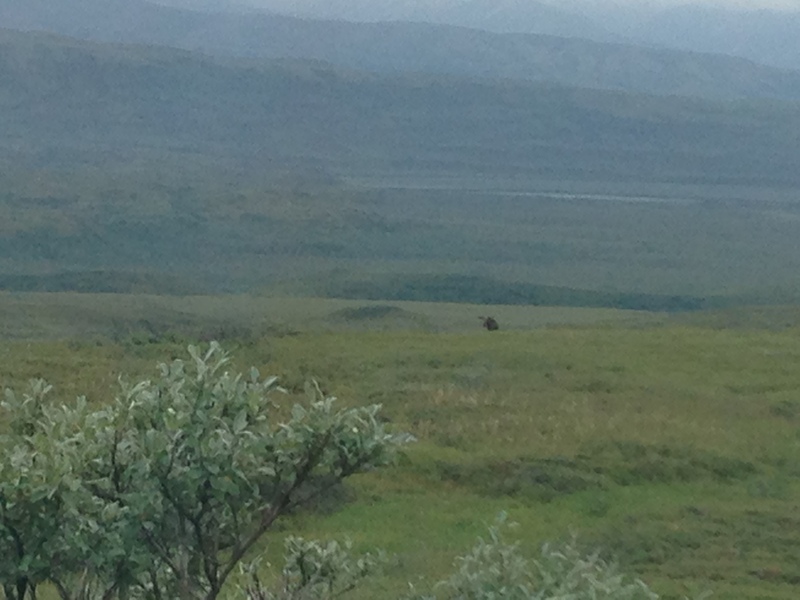 Our first glimpse was a herd of caribou lounging around in the tall grass. 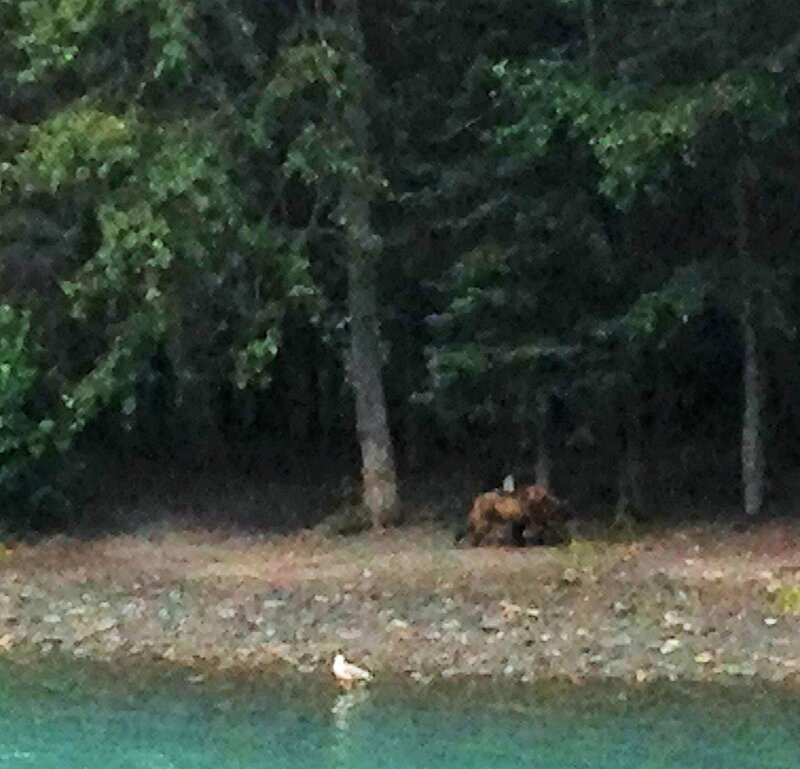 Then we got to see a grizzly bear wandering around eating blueberries of bushes trying to get his fill before winter. The bull moose eating away in this huge bush was really something. You could see the light colored velvet from his antlers. We were also surrounded by tall mountains, glistening with snow and glaciers. 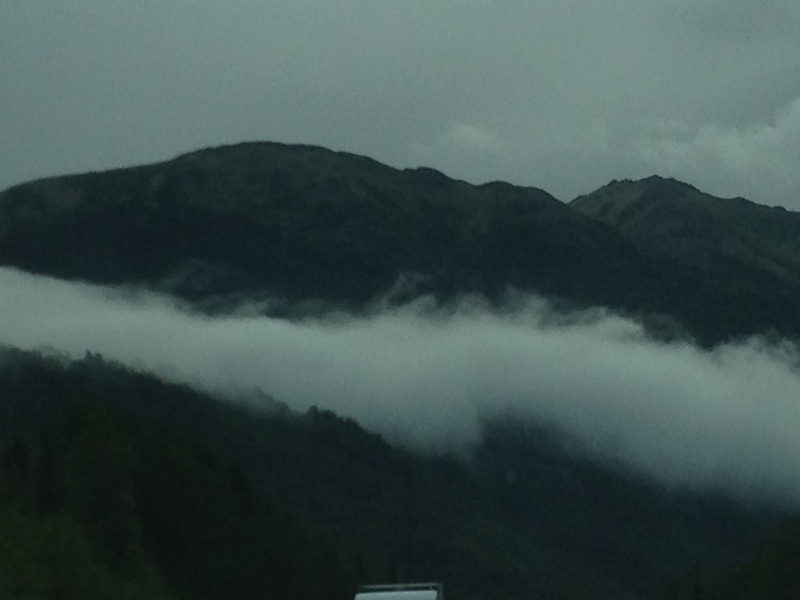 But we didn’t see Denali at all as she was socked under the clouds. We stayed in this motel outside Denali that had an old railroad car as it’s lobby plus 2 rooms that you could stay in that were also railroad cars. 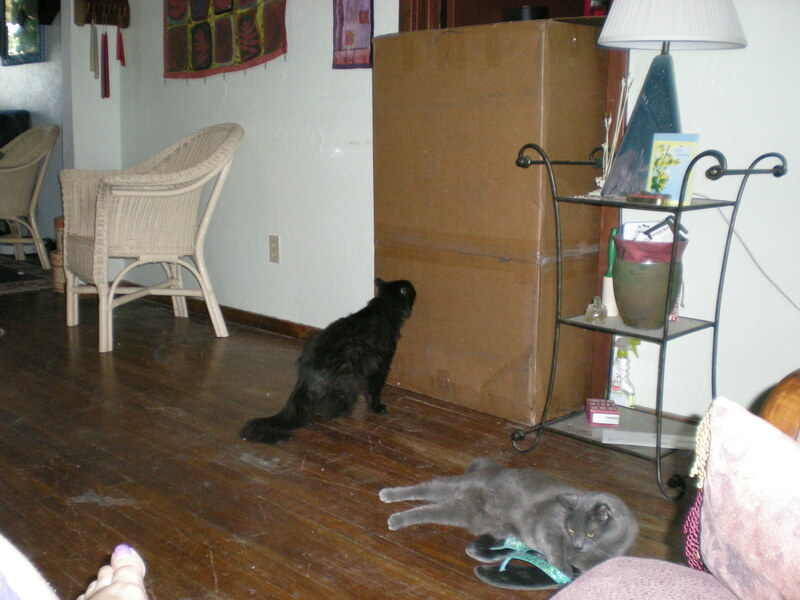 We were in the old fashion motel room with two small beds but it was clean and quiet. There however were not any moose wandering around the parking lot. On the way back to Anchorage, we had blue skies and sunshine and Denali. The Mountain was out! We even had to pull of the side of the road to take pictures. For many people seeing Mt. McKinley never happens when in Alaska so I feel rather fortunate. But there was more to come! After a morning hitting the resale shops in Anchorage, picking up some low costs Alaska tshirts and having a nice lunch, we joined Anchorage Knitting guild at our friend, Marty’s house. What a lovely bunch of women. And what great knitting projects. Socks, a lovely white bedspread, pretty baby blanket and a ribbon scarf. It was fun just sitting there knitting along and listening to discussions about local restaurants and more. One of the highlights. Made me want to stay in Anchorage just to be part of this great group! Then after dinner at a mexican restaurant – with alfredo sauce as one of the options (really?! ), we left early the next morning to head down to the Kenai and to take our 3 hour cruise. (No need to pack our evening gowns). The cruise on rough water, was fantastic. We got to see the sea otters wave us out to the bay. 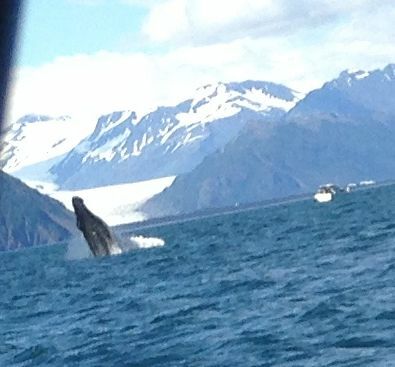 Sea birds, puffins, mountain goat and then the highlight – humpback whales leaping and waving at us. It was a sight I’ve never seen before. And this was only halfway through my alaskan trip. 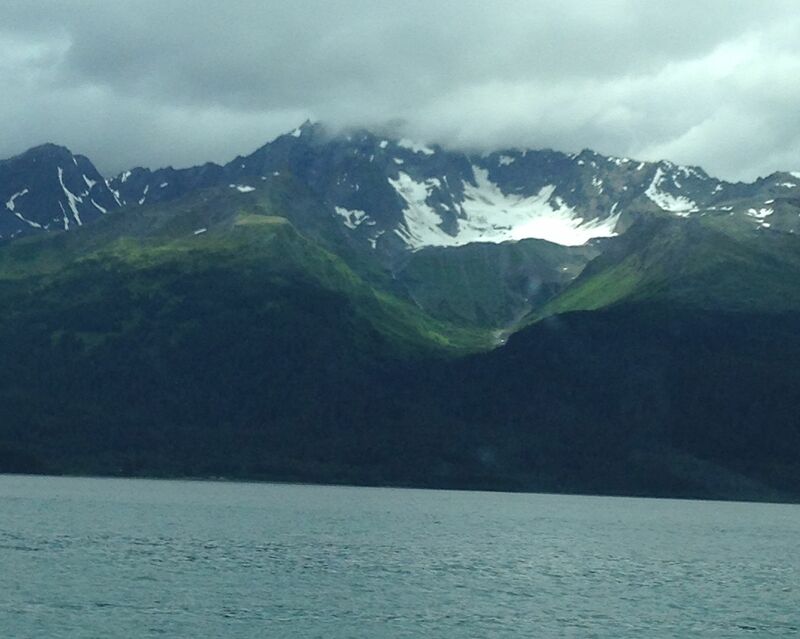 I must admit that Alaska is a wonderful place to visit. So much to see and I hardly touched the tip of the iceberg. And after all this driving back and forth on the roads (all under construction) behind many many RVs and seeing lots of fishermen/women as it was the salmon spanning season. I still enjoyed it all. We spent a lot of time visiting galleries around the Kenai and Anchorage and it was very inspirational. I got some alaskan inspired fabric from some of the fabric stores – lovely batiks, a few antler buttons, beads and charms, and even a knitting pattern to make some washcloths with moose on them. It made me miss living by water and huge trees. Though I have the mountains in Tucson, there is something nice about that slight chill in the air and the smell of spruce trees. After we dropped Lori off at the Anchorage airport, we picked up Pam’s husband He nri (who had been fishing for 2 weeks in the Kenai) and headed back to Soldatna for the final few days of vacation. The cute cabin we stayed in had two lovely St. Bernards living there as well. I slept under two lovely hand-stitched quilts and looked every morning and night for that moose to wander up to my window. Here I got to see an eagle fly over my head, bears fishing in the Russian River and relaxed with fishing friends and continued knitting on my shawl. Henri can spot eagles and bears while he’s driving along rather well. Heading back to Anchorage for our last day in Anchorage, we passed dahl sheep on the Turnagain Pass and an eagle sitting on the water’s edge waiting for lunch. The rain followed us up the coast. Then we had a bbq at some of Pam and Henri’s friends. And while sitting at the table, the entire house and table started shaking. An earthquake! 6.3! Once I can get my printer to talk to my computer, I will be printing out pictures and doing new artwork ideas. And knitting up moose dishcloths. When I was considering colleges, I choose the college that I went to because it offered a study abroad program. I wanted to see the world. 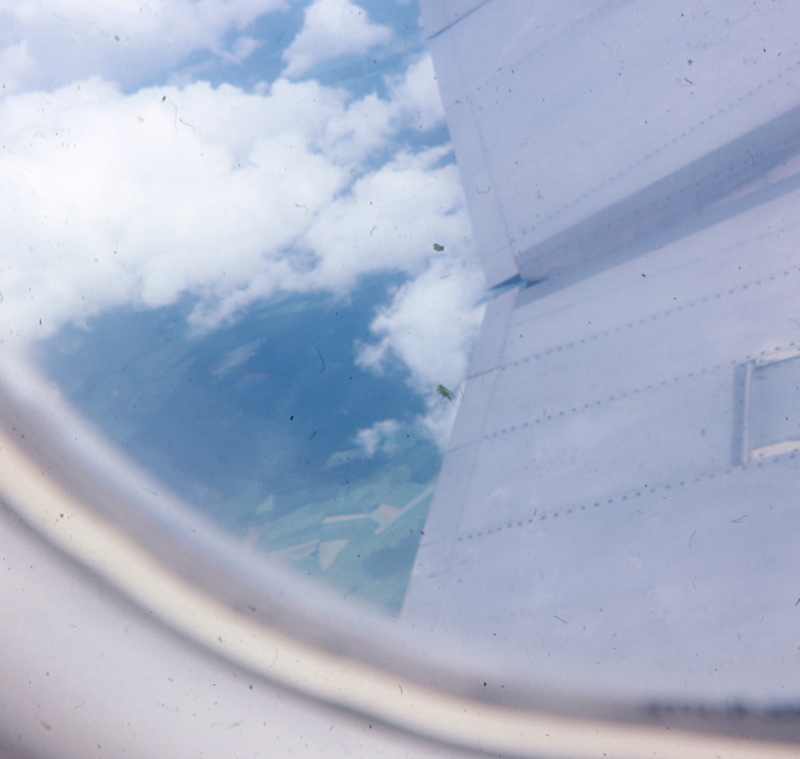 This was my first plane ride and being further away from home then I had ever been in my short life. My international journey started from New York to Iceland (since we were on Icelandic Airlines) and we spent an orientation week in Switzerland with the entire study abroad group. 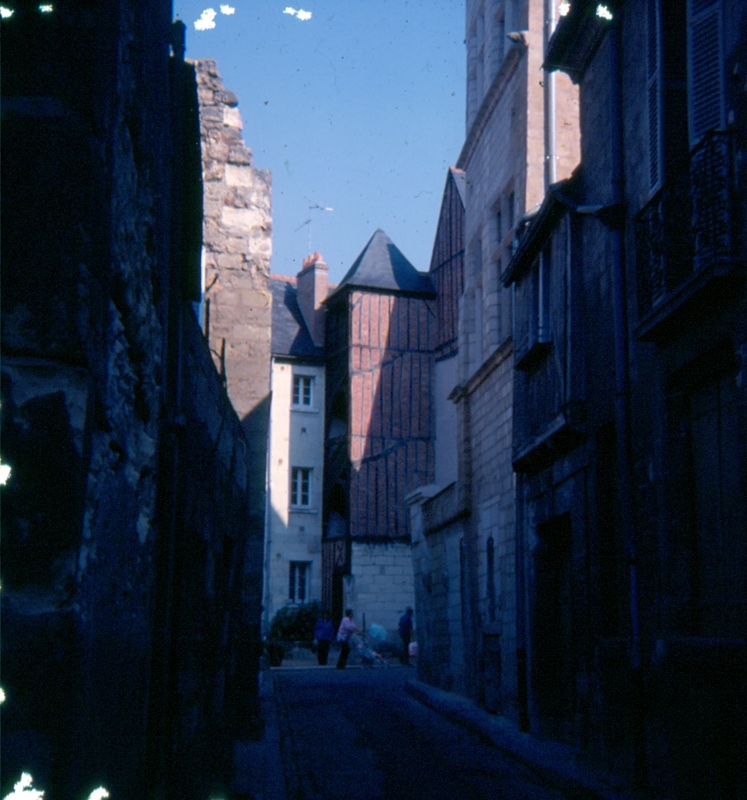 I spent that summer in Tours France studying french. It was a delightful town. 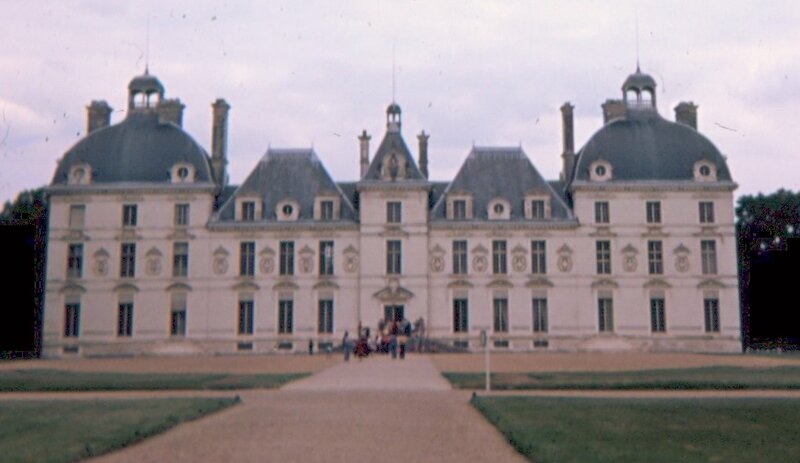 Located in the Loire Valley, on the weekends our group went to many chateaus and even one weekend in Paris. 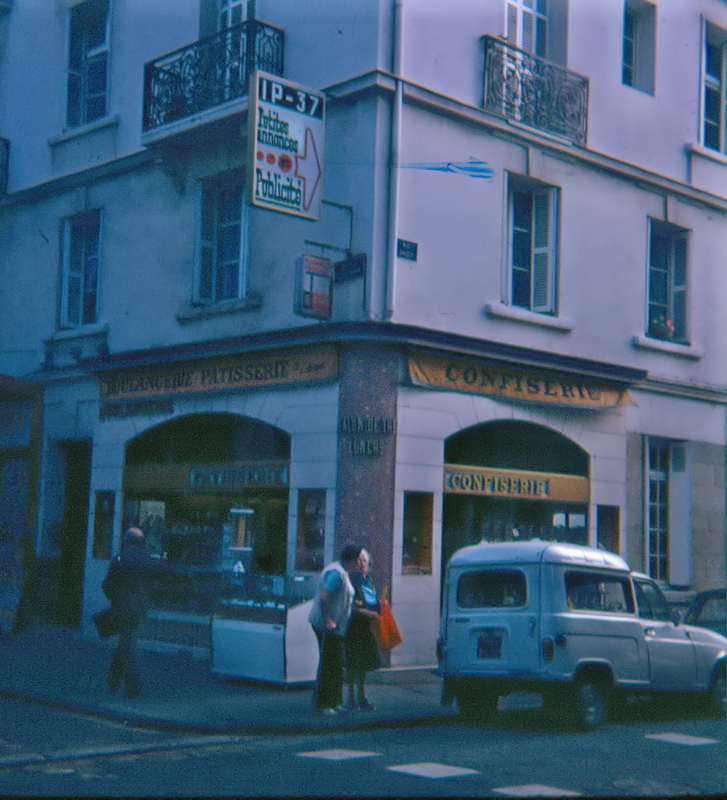 I loved the shops which were an excellent way to practice our french, drinking coffee, eating baguettes , french pastries, and nutella. Part of the experience was learning to really speak french in the classroom with this crazy french teacher who’d throw chalk at you if you mispronounced. Speaking with, or trying to with the people in the town. 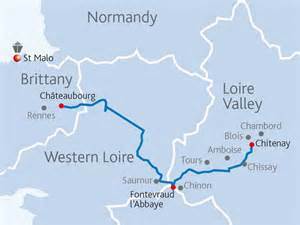 And at some point, after the three months realizing that I could speak “une per de francaise”. And I still can to some small degree. For some reason I took slides of my trip and after unearthing them, I scanned them into the computer and found a way to display my photographic memories by making these purses. They had faded a lot over the years. And when printing them, the faded images were apparent. 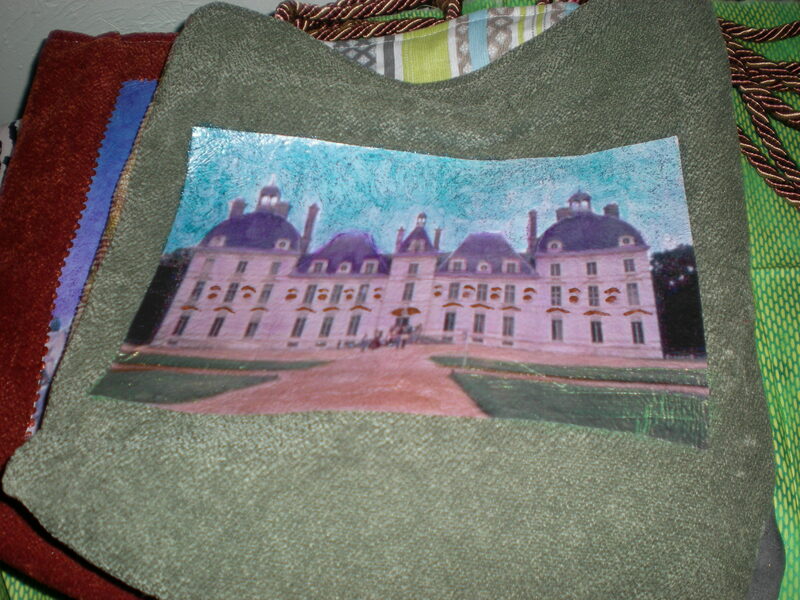 The images I printed onto fabric transfer sheets and then ironed them onto fabric. 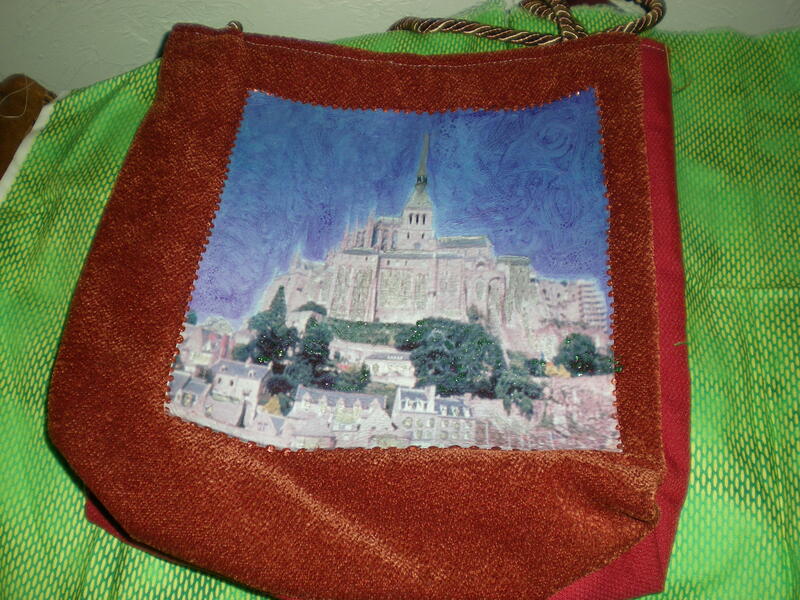 These purses are all recycled fabrics that I received from a friend who works as an interior design firm in town. The size of the purse is determined by the size of the fabric swatch. for? 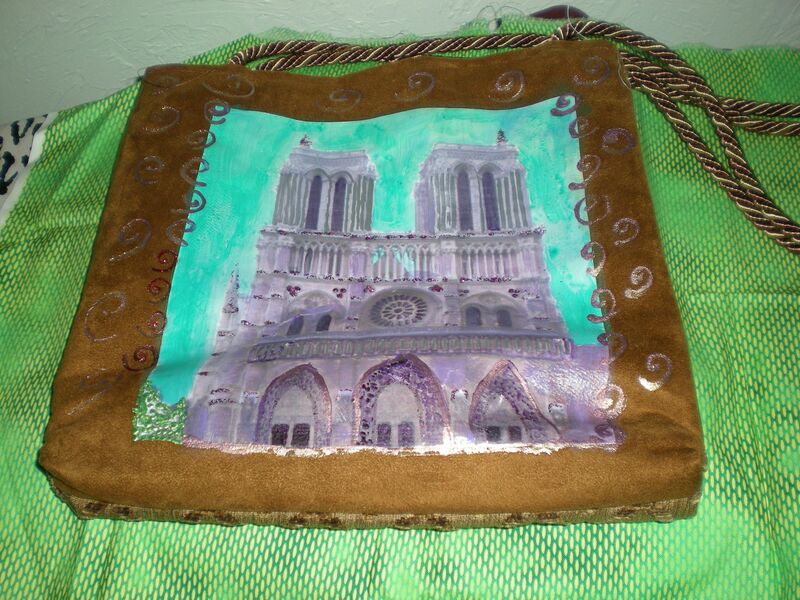 And I used regular fabric paints that you can purchase at Joanne’s or Michael’s. The sky becoming greener. 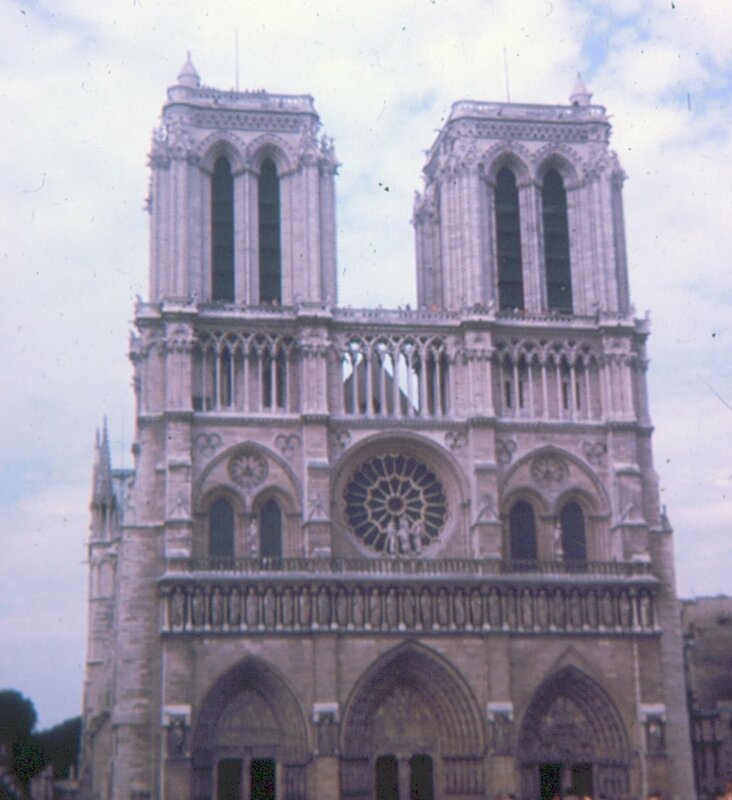 Notre Dame acquired some detailing with copper and some more color to the faded stone. 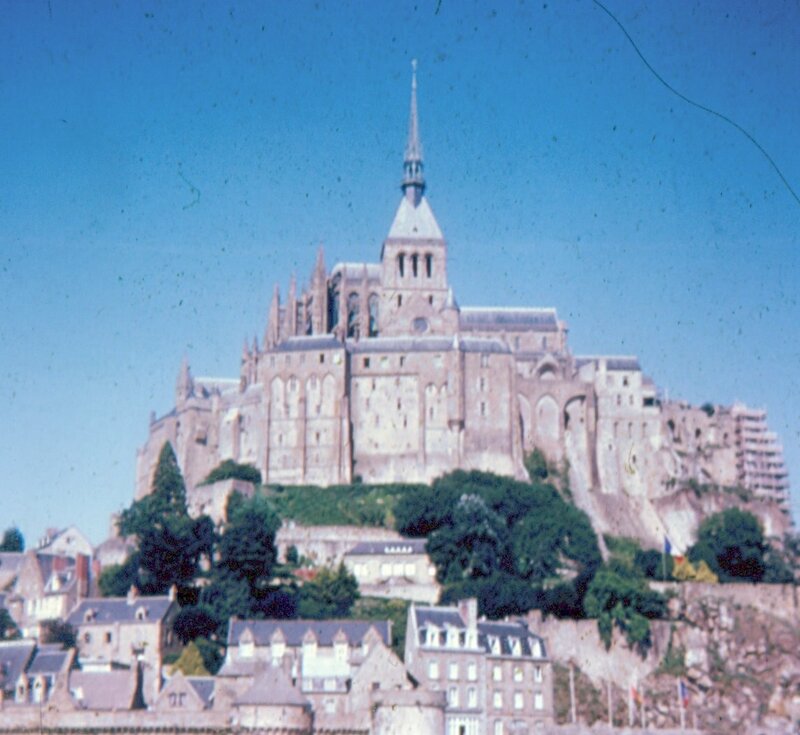 Of course I loved seeing Mont Saint Michael. Such a fabulous and amazing place to visit. The remoteness of this place and the inaccessibility from tide to tide was such a contrast to see. 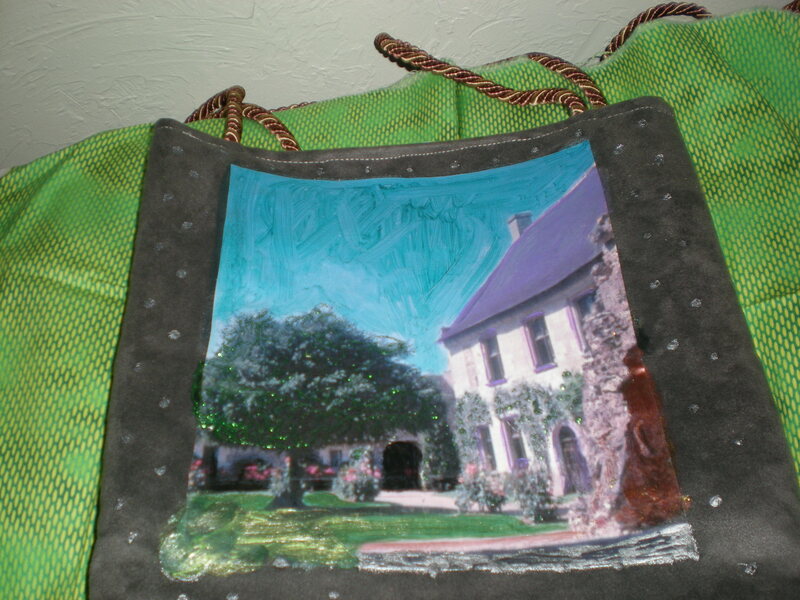 These next purses were from chateaux which were really fun to embellish. 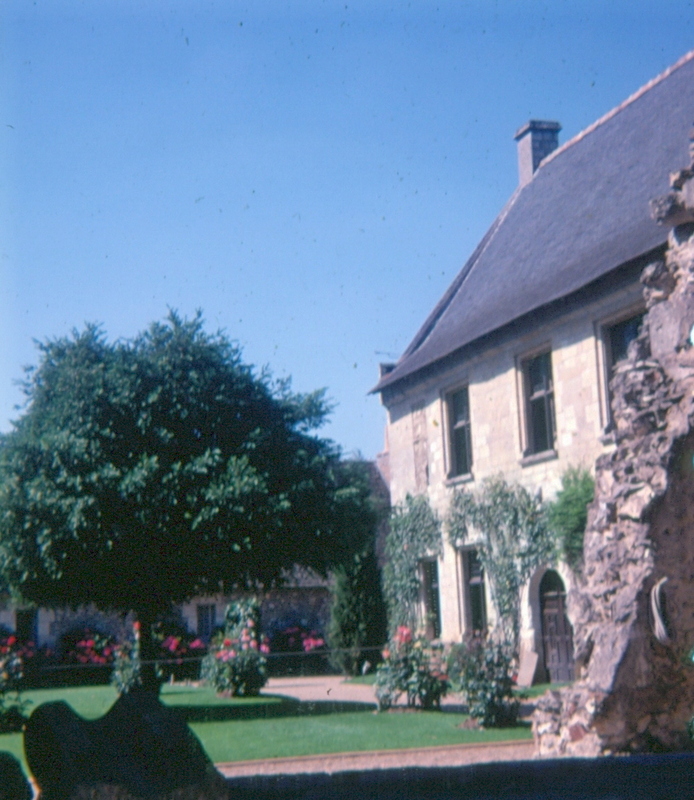 My dream now is to go back to France. Maybe this time I can teach this technique. One can never tell. I am getting ready to change my life into some new directions. Part of that involves retiring which is an odd thought as I’m not really at retirement age yet. My dad always thought I was too young to retire yet but I’m taking the plunge. The other part is to start doing more art not just in my free time and to make more art. 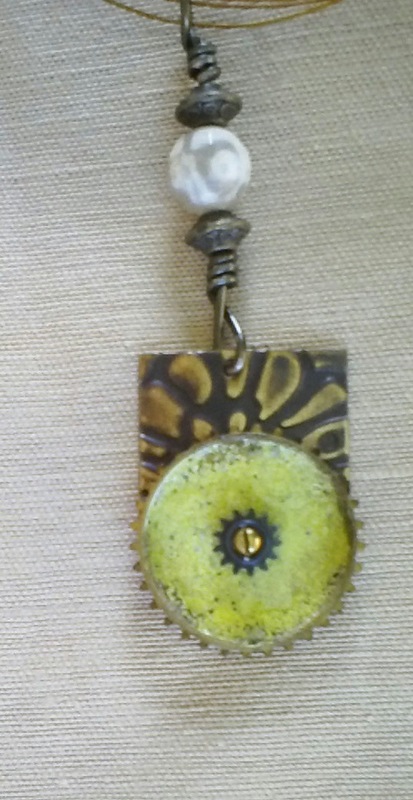 My one big news is that I am teaching at both Beadfest 2015 in Sante Fe and Bead and Button in Milwaukee. I’m looking forward to trying this new adventure. It is part of me trying to become myself and to realize my dream of being an artist. It is part of the journey of my life that I am traveling on, to see what is at the end of that path that I am now choosing to follow. What am I teaching? 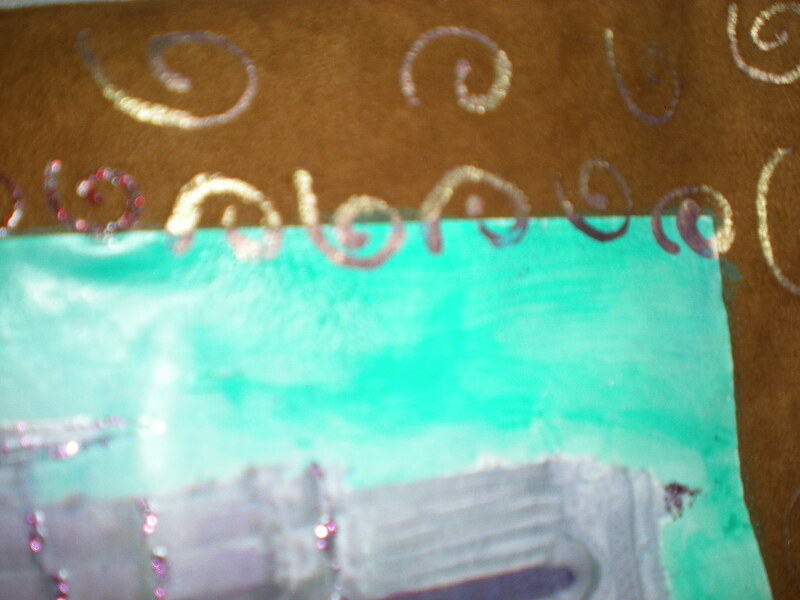 Two classes – and one using polymer clay and one using metal and embossing techniques. I wouldn’t be doing any of these jewelry pieces, if I hadn’t taken classes myself with both Susan Lenart Kazmer and Lisa Pavelka. Both of these ladies have been very inspirational and such fun to take classes with! I hope that I am able to be the same type of teachers that they are. I also highly recommend taking classes with either of them. If you love metal or are curious about it at all, Susan is a great source of knowledge. Also her ice resin and embossing powders are great. If you want to learn about polymer clay, magic glos, crystals or even viking knitting, go to Lisa. I cannot even imagine how my art would be without having learned techniques from these guys. 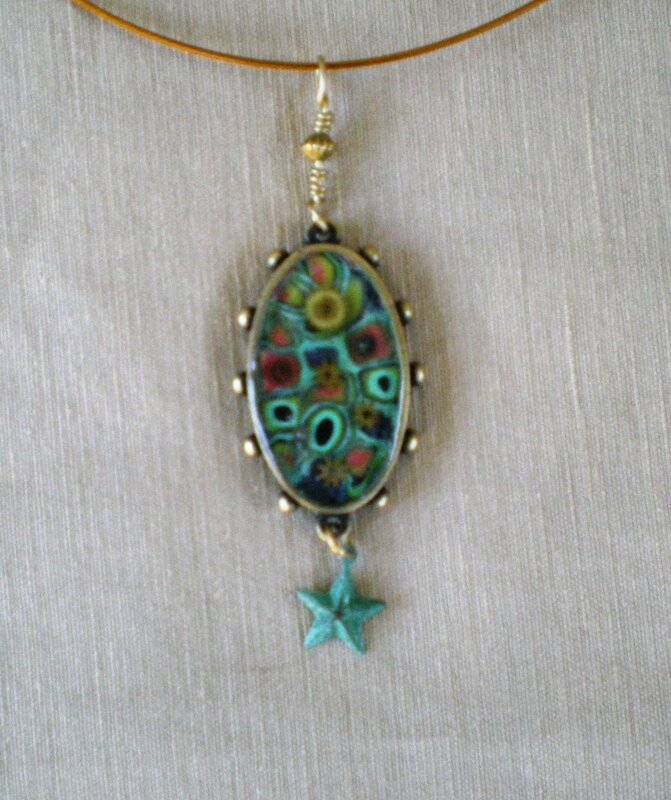 But I also need to credit my local Polymer Clay Guild for learning this particular polymer clay extruding technique. A guild is a fabulous place to meet other people who are interested in what you are, hang out with them, laugh with them (at times cry with them) and build up a community of support that you didn’t realize you needed. The Tucson Clay Guild is such a place. It has turned the Tucson Gem and Mineral show into a party week with dinners and the annual polymer clay party (thanks to another great artist, Christi Friesen). I am very grateful to all these artists and friends who I have been able to learn from and who have joy to my life. I think that we can all continue to grow and expand our lives by taking classes and learning new things no matter how old we get. Or at least this is what I am going to try to do. And so my new adventure begins. One of my favorite authors, May Sarton wrote a journal about her journey finding a new home and filling it with her parents’ furniture. Like May, I had to deal with the death of both my parents and had to take apart their lives together in that house that they lived the majority of their retirement lives together. I had to wander about having to make decisions suddenly and rapidly and hoping that the decisions I made were ok. 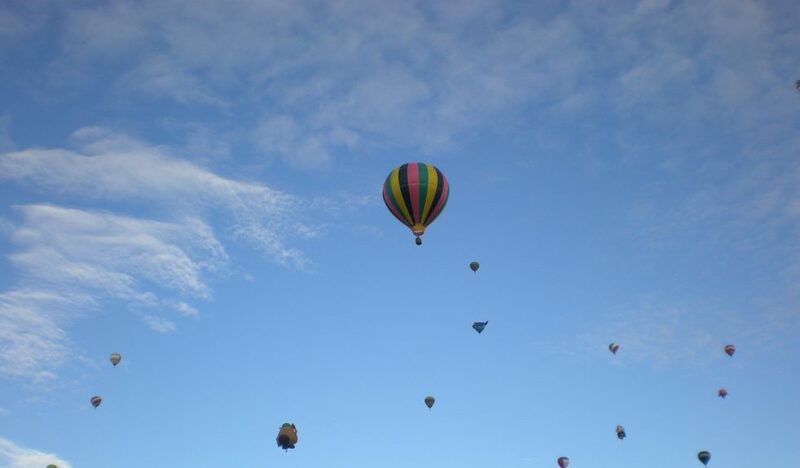 I have always felt that I was dreaming deep in my life here in Tucson. I ended up living here after a divorce which tore me apart and left me having to figure out what will my life be now. But I managed to find a good job at the University and have worked for and with some great people. Some of these are now my closest friends. And I also bought a house for the reason of wanting to have a place to call my home and a place for my floor loom to live. I got this little 1925 Tucson Bungalow house just to fit my loom. And it have been a happy and creative place. In addition to the loom, there is a table where I make my jewelry, and work with fabric. The list constantly expands. 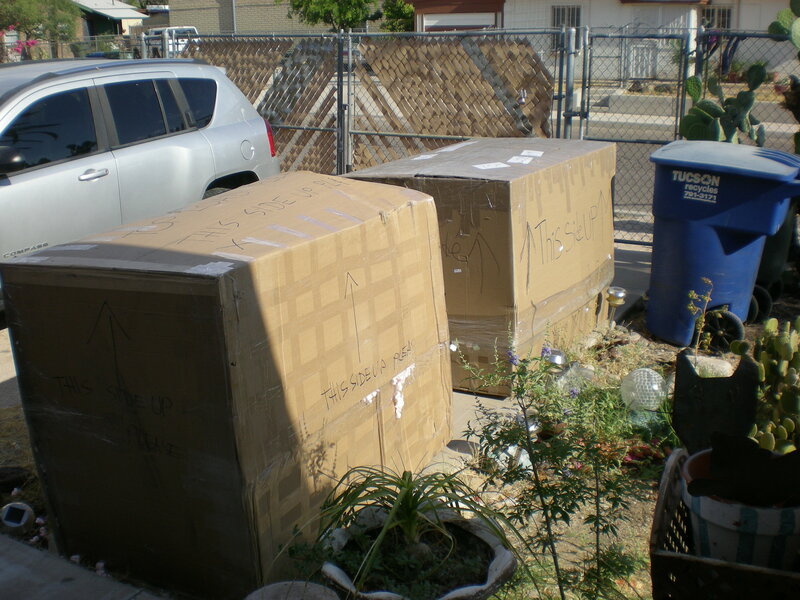 In June, the furniture from my parents’ house arrived as well as boxes filled with old clothing, old envelopes, quilts, dishes. On one wall the case with my dad’s flag hangs in his honor. My mom’s quilt now hangs about my bed. My own fear like May’s was would their furniture languish in my house full of my other furniture, tucked here and there, feeling crowded out? Or would the pink packing peanuts take over the place like the creeping pink ooze from some horror movie? 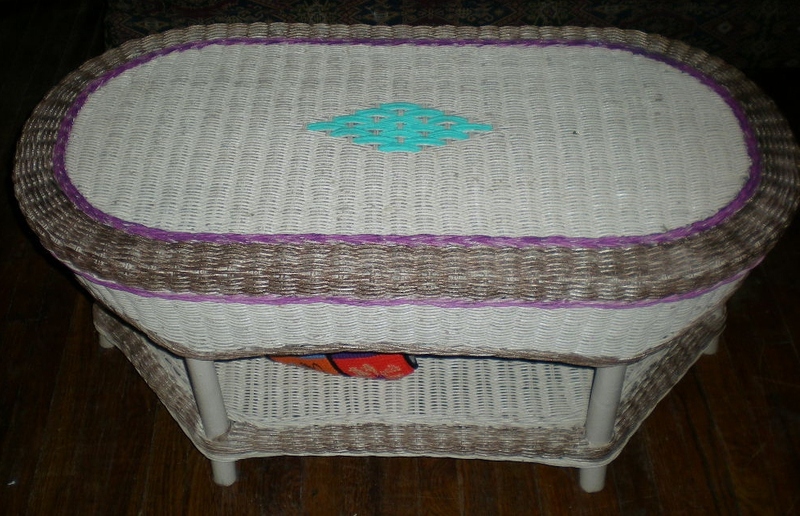 And their wicker furniture now gracefully fills my house after a few months of quandary about how to fit it all in and what to remove. It was a hard decision. 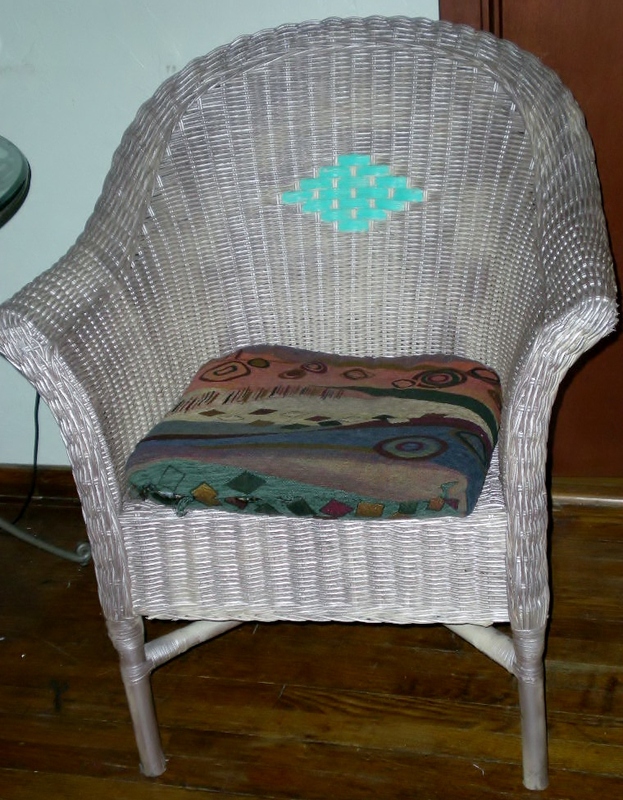 In the end, my lovely rattan futon frame and my hand-tiled coffee table has found a new home with my good friend, Nura. 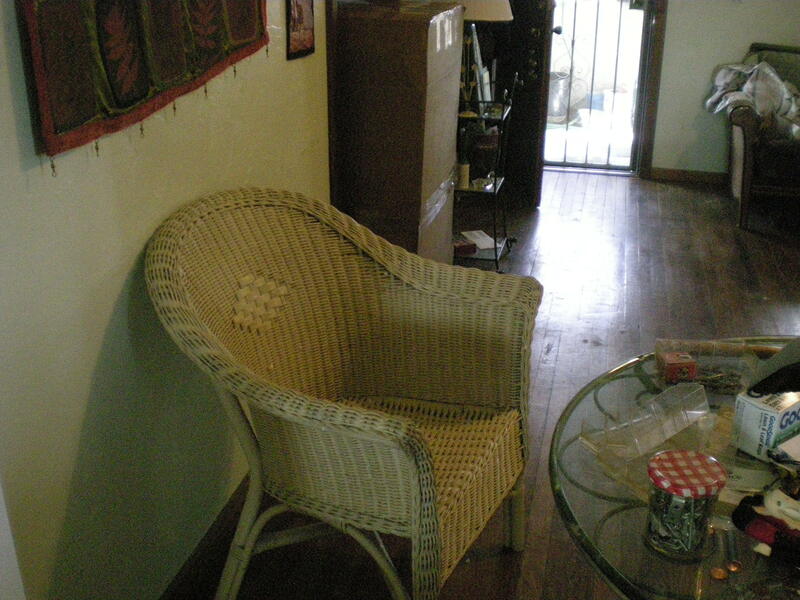 In their place, are the wicker chairs and tables that my parents had had in their home in New Jersey. My childhood home. The parson’s bench that my mom had in their living room, sits now in my dining room with generally one of the cats sleeping on it. But the wicker was white and off white. And my house really wasn’t ready for a new white pallet. So I started stalking the aisle of ace hardware’s spray paint seeking inspiration. Now at last it feels more like my house. And I find like May that I feel their happiness in my house and find myself lifting out of the grief that has been saturating me throughout the hot Tucson summer. May’s writing has always been a source of inspiration to me. And now it is only fitting that she gives me some guidance getting through the maze of being an orphan. 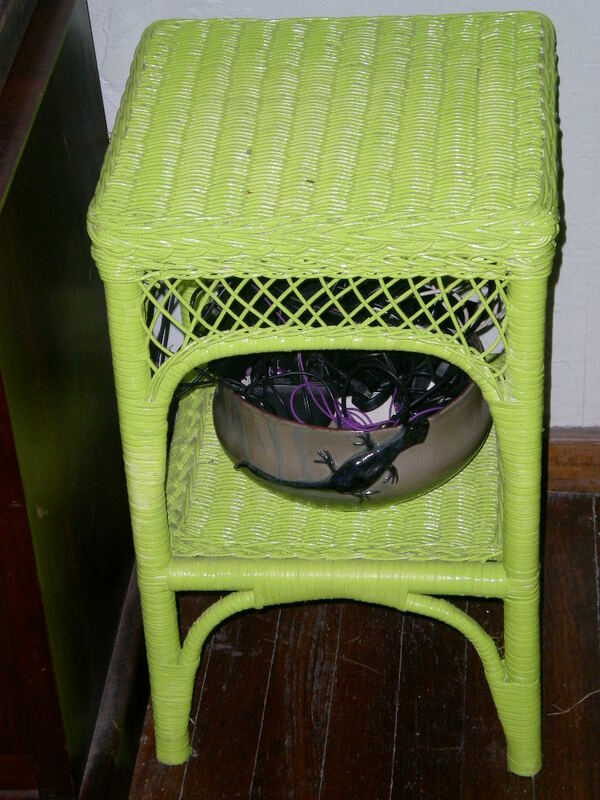 But now my new refreshed wicker pieces have my touch on them. And I can look at them and remember my parents and their happiness and the fun times and life that we shared.